Rockport walking test: Best, easiest beginners cardio fitness test! 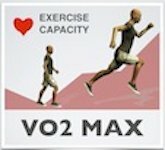 Find your VO2 Max with our fitness calculator. WARNING: This calculator will not function until you enable Javscript. Note: This test is most accurate for non-athletes and people who are unable to jog. 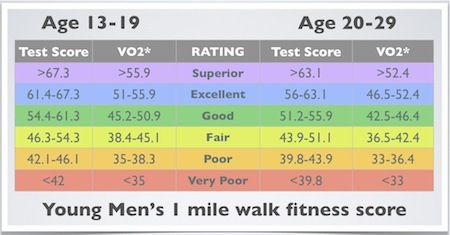 If you are a good runner, the Cooper Test is the best measurement of your fitness. 1) Walk as quickly as possible for one mile. It's important to maintain a steady pace for best results. 2) Enter your time in minutes and seconds into the calculator above. 4) Once you have your pulse, count for 10 seconds. Multiply this number by 6 and enter it into the calculator also. 5) Look up your results and find out which physical activities are best for your fitness level on the charts below. Ladies in their 40s with a VO2 Max lower than 24.5 (Poor) had a 39% higher risk of contracting diabetes than their more fit peers (2). Men rated in the highest 1/3 of fitness (just below Excellent or better) have a 39% lower risk of heart disease and stroke than their peers in the lowest 1/3 (just above Poor or worse). (3) Premature deaths among obese men could be reduced by 44% just by improving fitness above the poor category (4). Want to learn more about the best ways to test your health and fitness? Check out this video below. Download my free eBook, The Five Most Important Health and Fitness Tests. This guide is the perfect starting point to help you track your health risks and keep them as low as possible. You'll be able to set exercise goals for what you truly need to develop and maintain good health and fitness. 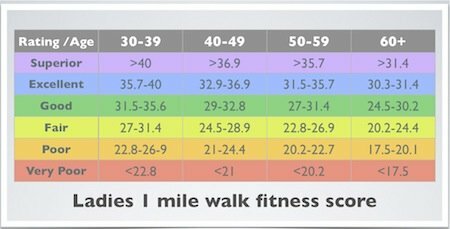 *Continue reading to pick workout routines and activities that are a good match for your score on the Rockport Walking Test. The charts below help you pick workouts and physical activities that match your ability level. 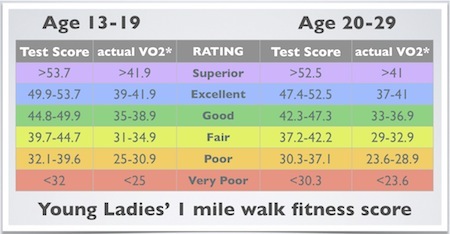 Find your fitness level (VO2 Max score) on the left, and then you'll see a Metabolic Equivalent rating for moderate, vigorous, and hard workouts. 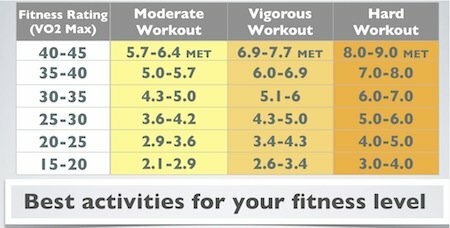 Next, look at the bottom half of the chart, which shows activities that have just the right exercise intensity for you. Choose from even more workouts and physical activities here. The Curl up test is the most scientific and accurate abdominal test you can perform at home. (1). For best results, be sure to follow the illustrations and instructions. Return from Rockport walking test to physical fitness tests.